The ruins of the ancient city of Teotihuacan are located about 50km (30mi) outside of Mexico City in the state of Mexico. The country of Mexico is divided into 31 states and a federal district which is Mexico City, referred to by locals as D.F. We hired a guide who walked us through the ruins for 3 hours and even took us to an outside house which we hadn’t seen in any of our previous visits. Teotihuacan is an enormous complex and what is available to the public is but 20%, the rest is privately owned land and people still live on it. 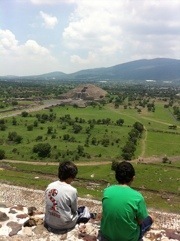 A common misconception is that the Aztecs built Teotihuacan, they didn’t. 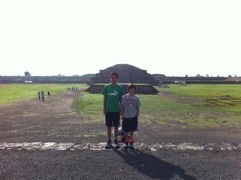 Teotihuacan was built by the Teotihuacans in about the year 300BC and they inhabited it up until about 700AD. It had 200,000 inhabitants at one point. 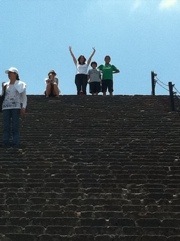 When the Aztecs (or Mexicas) happened upon the city on their southward migration, they found it abandoned and were so amazed by its size and splendor that they thought it must be the place where the Gods had created the universe and thus named it Teotihuacan. 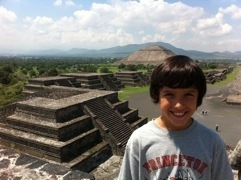 The Aztecs did their best to explain what they had found, the names we know today were assigned by them. 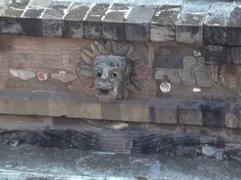 The Aztecs held Teotihuacan in such high regard that although they never inhabited it, they made regular pilgrimages to it for religious and ceremonial rituals. 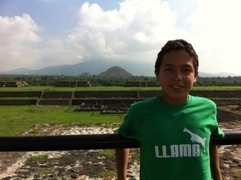 The first building we visited was the Temple of Quetzalcoatl. This temple was found in very good condition because it was covered, on purpose, with another pyramid built by the Teotihuacans around it before they left the city. 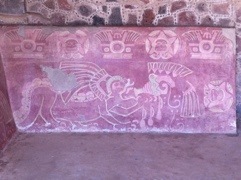 Quetzalcoatl, the Feathered Serpent, was revered by many of the Mesoamerican people. 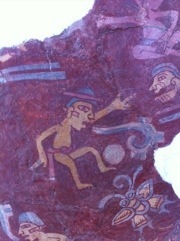 From the descriptions left us by the Aztecs and a few remaining murals, we know that the entire city was adorned in red, green and white paint and statues had obsidian eyes. In places you can still walk on red patches of the original floors. 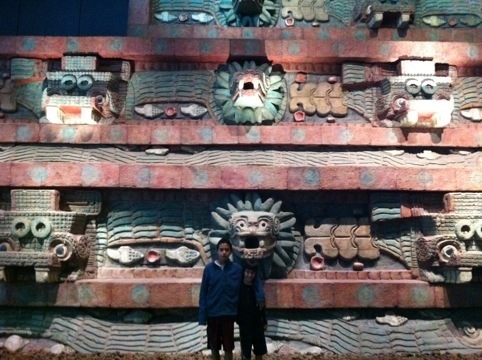 This is a reproduction of the Temple of Quetzalcoatl in the Anthropology Museum. Next we visited a house on the outside of the main complex which is believed by some scholars to have been a school due to its murals which depict happy people engaged in different games. 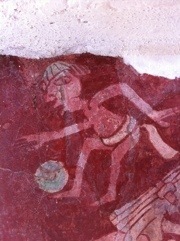 There are paintings here which look very much like a soccer match. 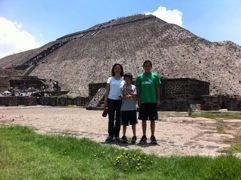 Probably the most famous of all the buildings in Teotihuacan is the Pyramid of the Sun. It has a height of 65mt (213ft) and was built facing west towards the setting sun. 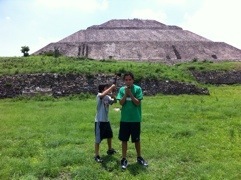 This pyramid has a moat around it and recent discoveries have led some scholars to postulate that it was dedicated to Tlaloc: god of rain, thunder and storms; god of celestial waters. It was quite a climb and I was surprised that we made it without much trouble. The views from the top are amazing. 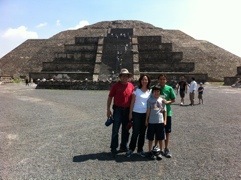 We walked along the Avenue of the Dead toward the Pyramid of the Moon. 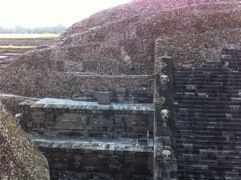 The Aztecs named the 2km (3.2mi) street, Avenue of the Dead because of the many small temples lining both sides of it. They thought these temples were cripts. Today scholars believe these were dedicated to lesser deities. Behind these temples there are family houses. A family was made up of grandparents, aunts, uncles, parents, children and cousins and it could easily consist of up to 60 people. Family houses were always built with an inner patio and several rooms which opened onto it so although they shared a house, each smaller family unit had their own room and thus some privacy. These houses had indoor plumbing built on a slope. Right in front of the Pyramid of the Moon, a statue of Chalchihuitlicue, goddess of calm waters such as lakes and streams, goddess of terrestial waters, was found. This, and sea motifs such as shells that have been found near it, has led scholars to believe that this pyramid wasn’t dedicated to the Moon. The modern theory is that the Pyramid of the Moon, actually the Temple of Chalchihuitlicue, is giving birth to the Milky Way, simbolized by the Avenue of the Dead; and it was built in a north-south direction oriented toward the Pleiades constellation. The entire complex is visible from its top. At the time of the Spring Equinox, exactly at daybreak, the shadows thrown by the stairway on this pyramid look as if it were a snake descending from it. We’ve seen it once and certainly recommend anyone who has the chance to, brave the cold and do it too. The only building we didn’t get a chance to visit was the Temple of the Butterflies which lies on a side of the Pyramid of the Moon because it was undergoing renovations. 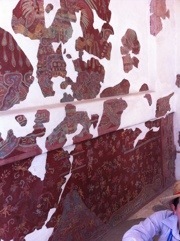 What’s really special about this temple is the murals of butterflies and bats in it. 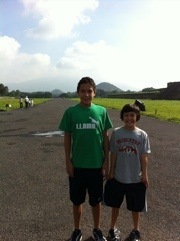 We had a great time in Teotihuacan. 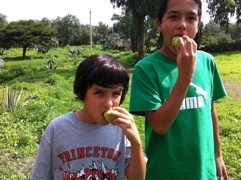 When we were done, Fernando cut open and peeled some prickly pears. I usually don’t like them because spitting out the seeds is too much work but these were so sweet, even I had some. 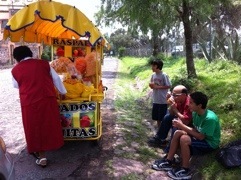 On our way out, we stopped to enjoy some “diablitos”; a tamarind/mango/lime shaved ice with tons of chili powder. Just what we needed after spending four hours climbing pyramids in the scorching sun.